Barcelona, March 2019 – Now it’s easy to light up long stretches of deployment areas even on extreme conditions without the hassles of conventional heavyweight light towers thanks to the new system presented by PELI Products, Global leader in the design and manufacture of advanced portable lighting systems, PELI 9600 LED Modular Light. 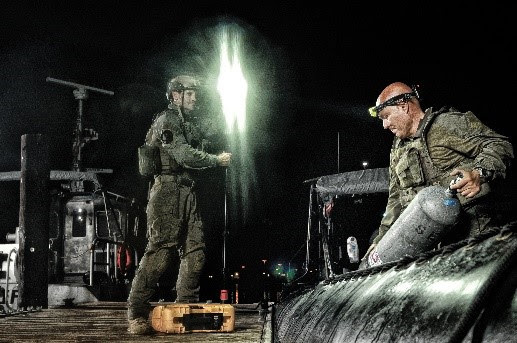 With more than 40 years of experience in optimal protection solutions PELI Products ensure the success of your military missions, find these lighting systems at IDEF show 2019 (Hall 2, Stand 248A). This powerful solution uses special optics to offer continuous lighting fully compliant with the HSE (Health, Safety, Environment) requirements for illumination. Moreover, with fewer lights chained up, you will be able to cover the deployment area as other linear lights, having a cost-effective result. PELI™ 9600 LED Modular Light illuminates a clean, seamless beam spread without dark spots, while competitors’ lights produce a dull, uneven beam spread. The 9600 offers minimal light transmission loss in comparison to similar linear lights; the declared 3000 lumen value per light head is the true verified light output. Similar systems may lose some of the declared lumen value due to the material and design of the lens, but the unique ‘optically clear’ polycarbonate used for the custom recessed 9600 lens reduces scratching, light transmission losses and provides light exactly where it is required. Engineered with side/end bracket mount receptors and four strap attachment points, plus a stand system that can extend up to 3m, the 9600 is ready to mount to fences, hang overhead or stand on its own. The Interlocking Stack Pattern makes transportation and storage simple, resulting in a cost-effective use of space during military operations. Its durable design with internal shock supports has been tested onto concrete to withstand drops from 3 m and wind speeds up to 40 km/h in extended mode (2,85 m mast) and up to 35 km/h when folded (1,85 m). Proof that this light was designed to use in extreme outdoor conditions. Throughout the years, PELI has grown to be the trusted expert in ATEX lighting products, fully complying with the latest Directive and thus ensuring worker’s safety. To meet the exacting requirements of ATEX directive 2014/34/EU, PELI Lights are tested to ensure that they pose no threat of ignition when operating within hazardous locations. Using approved laboratories, the lights are tested to ensure that they will withstand rigorous impact and drop tests, severe environmental exposure and meet a minimum of IP54 water and dust ingress protection. Longevity and safety are assured by design. What are the latest additions to PELI´s ATEX certified lighting range? To illuminate larger deployment areas, confined spaces or potentially hazardous zones, PELI proudly introduced the 9455Z0 RALS – the World´s first portable floodlight with three global safety certifications: ATEX European Zone 0 (Cat.1), IECEx ia and CI, D1. PELI´s Remote Area Lighting Systems (RALS) provide fully portable, powerful, energy-efficient and rechargeable lighting without the use of a generator. These LED floodlights make working in remote areas easy, are self-contained and extremely easy to set up. The need for a military safe, economic and convenient alternative to generator powered lighting is answered.